Want to know what past life is directly affecting you present incarnation? Well then this reading is for you. I will use several decks to divine your questions and reveal to you an important clue that can uncover the past life that is affecting this particular incarnation. It is energy that we need to balance and heal so we don't continue to relive the same romantic/general karmic lessons, from lifetime to lifetime. This reading will help shed a light on what you can do to overcome the particular energy or situation that you must heal or release. The first of card will show you the particular lifetime you are focusing on. 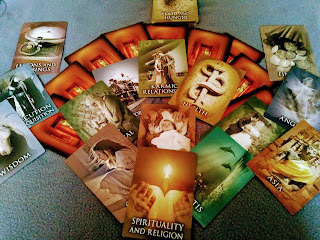 The first set of cards will shed a light on the energies that you are bringing into this lifetime to be healed. The second set will be the present energies with romantic partners or other people around you. It reveals how these energies affect them. The last set of cards is what you can do to balance the energy so you don't continue to relive it. How to heal the energy. I will also use other decks to support my findings and give you additional advice. Check the links on the blog to my paypal.